This week is InnoTrans 2016, the world's biggest rail industry trade show, held in Berlin, Germany. 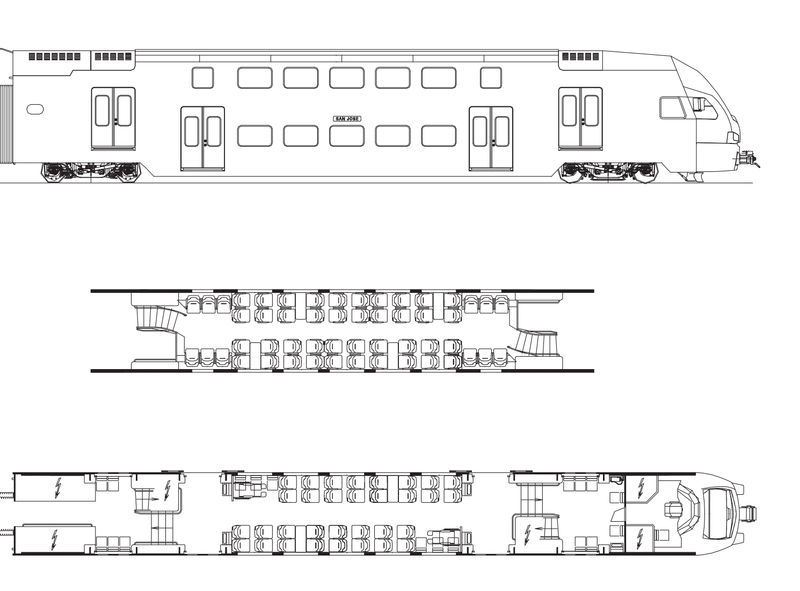 Stadler has a big presence there, and rolled out an updated website and downloadable brochures. Among them is a preliminary brochure for Caltrain's new KISS EMU, affording the first public glimpse into design details of Caltrain's new fleet. 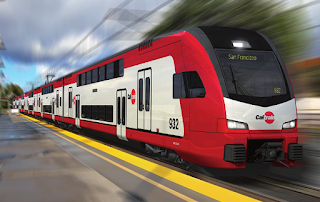 The Stadler KISS (recently re-branded KISS160) as configured for Caltrain is a high-performance train that will have no issues sharing the corridor with high-speed rail. 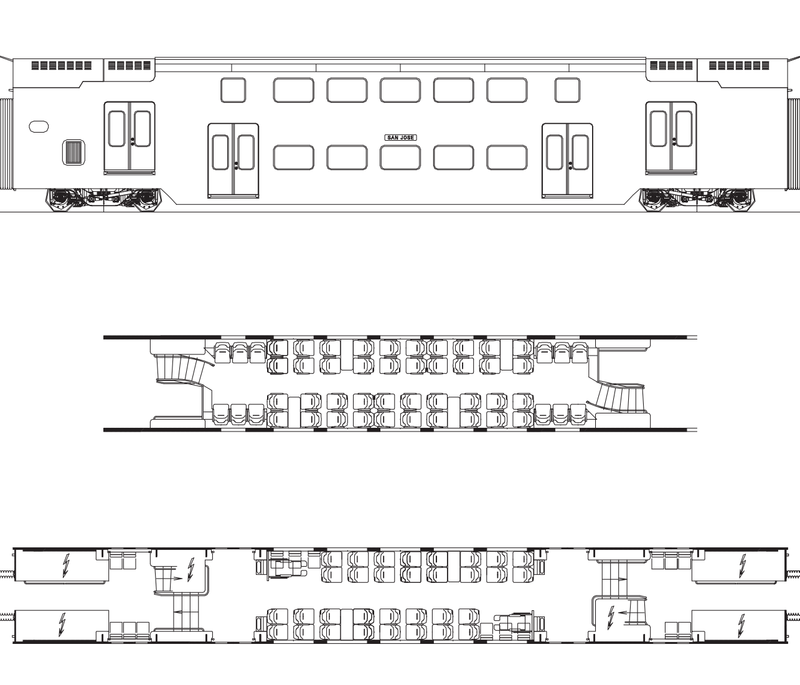 As delivered, the upper level boarding doors are sealed and 5 seats are configured longitudinally in each vestibule on the intermediate level, accounting for 10 seats per car. These seats will be temporarily removed during the transition to level boarding with high platforms (when both sets of doors must be cleared of seats), diminishing seating capacity by roughly 10%. 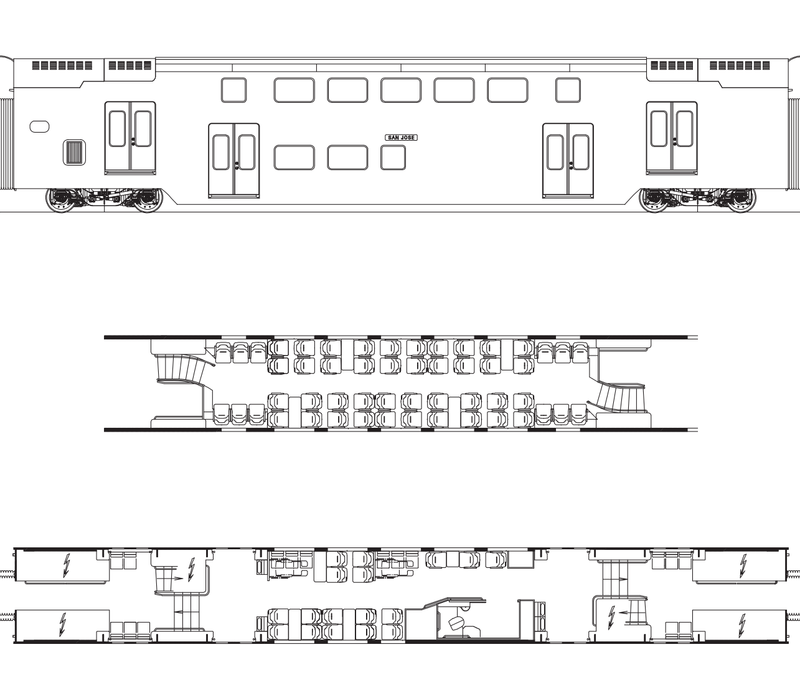 Once Caltrain achieves 100% level boarding, that seating can be restored on the lower level of each car. 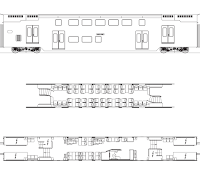 The layout for all six cars can be viewed by zooming into the original PDF brochure, or more conveniently as individual graphics extracted below. The seating diagrams reveal that the ADA bathroom displaces 15 seats. 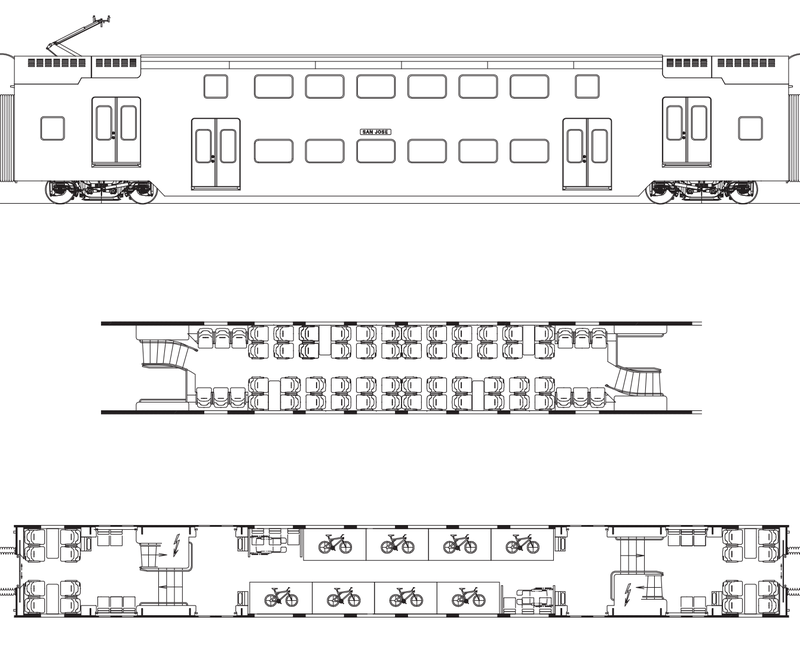 Interestingly, the Stadler diagrams show two wheelchair spaces on the lower level of every car, which appears to imply that ADA wheelchair lifts would be provided in every car to cross between the lower and intermediate levels of each car. 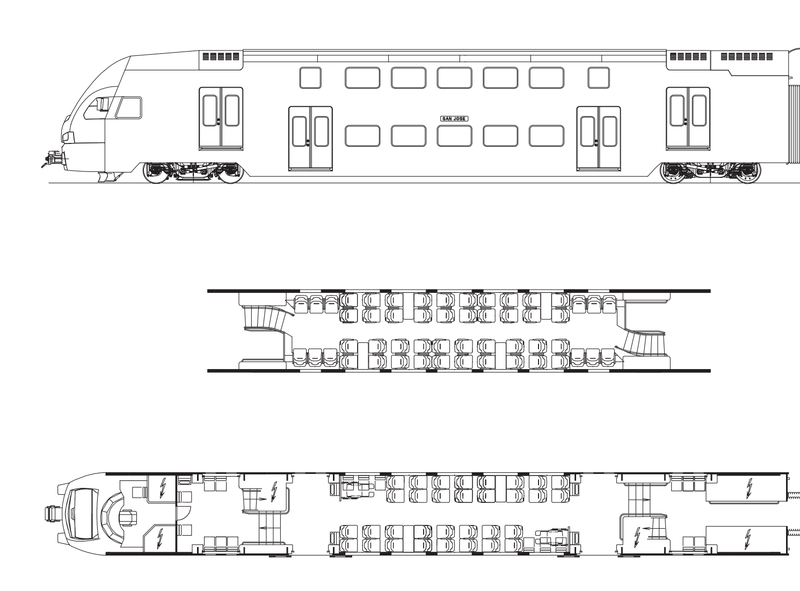 Caltrain's order from Stadler includes options for another 96 cars, which are planned to be exercised to expand the fleet to 24 trains and lengthen all trains to 8 cars or about 200 m long. 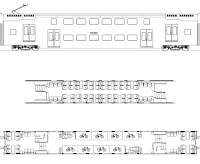 With the seating layout and train car dimensions defined, it is possible to predict the seating capacity of an 8-car train. The basic 6-car train already has all the traction equipment, so the two extra cars would likely be trailer cars similar to cars 3 and 5 above, except without the bike storage area on the lower level. Each of these extra cars would have 60 seats on the upper level, 46 seats on the lower level, and 26 seats on the intermediate level, for a total of 264 added seats. 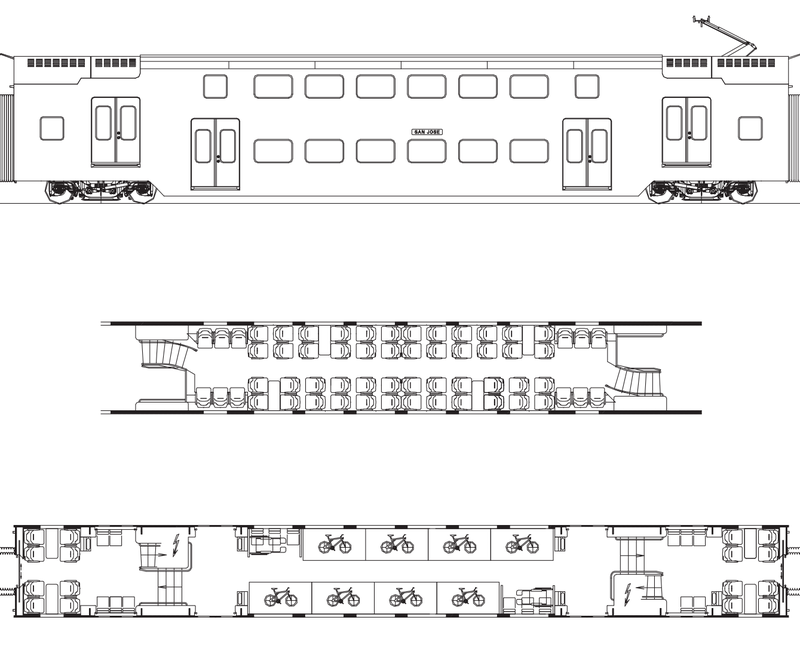 This would bring each train's ultimate capacity to 837 seats and 80 bikes, with plenty of additional space for standees.